Welcome to Thursday’s Card of the Day, where we are going to look at a card from our HeartGold SoulSilver Base Set and that is Noctowl. At first glance, we can see a Colourless Stage 1 Pokemon with 90HP, a single Poke Power and an attack to go along with that. Now this Pokemon did receive some form of attention when the format was first announced for its Poke Power, but it has kind of died out at the moment. Let’s have a look at the card..
First we’ll have a look at the Poke Power I’ve been talking about ‘Night Sight’. This Power actually has a very simple effect which is to, once per turn, you may draw a card. With this card sitting on the bench, you’ll be able to draw one card for the beginning of your turn and then another through this Poke Power whenever you like during your turn. In a format with very little draw power, this should intrigue the competitive player, but Pokemon like Magnezone really are outshining it at the moment. Noctowl can only get you an extra single card per turn, but Magnezone can net you anything up to six every single turn and possibly double that if you have two sitting there. However, Magnezone is a Stage 2 whereas Noctowl is a Stage 1 and it has 2 more retreat cost than Noctowl which begs the question why Noctowl isn’t being used. I’m going to take a stab at it and suggest that it’s simply because Magnezone has a much better attack than Noctowl does. ‘Lost Burn’ can effectively do an infinite amount of damage to the opponent which is impossible to beat, so let’s see what Noctowl actually does. ‘Extrasensory’ costs us three Colourless Energy to do 40 damage, but the small print tells us that if you and your opponent have the same cards in hand, the attack does 80 instead. Considering the energy cost, this attack isn’t too bad if the hand sizes match, but it isn’t going to be the most efficient of attacks since you’ll lose a maximum of three energy when it gets KO’d and the damage really isn’t amazing. It is interesting that it has the same kind of strategy attached to it as Yanemga does, so if absolutely necessary, you could take a swift KO with Extrasensory after a card like Copycat or Judge is played on your part. As you can see, the attack really doesn’t stand up to Magnezone’s damage output since Lost Burn would be able to do 150 damage for the same amount of energy Lost Zoned, but the speed of Noctowl certainly does wet the appetite of some deckbuilders out there. Artwork: I would say this artwork is another pretty strong one. Noctowl has always been portrayed as a mysterious bird with Psychic abilities and this image certainly captures this. 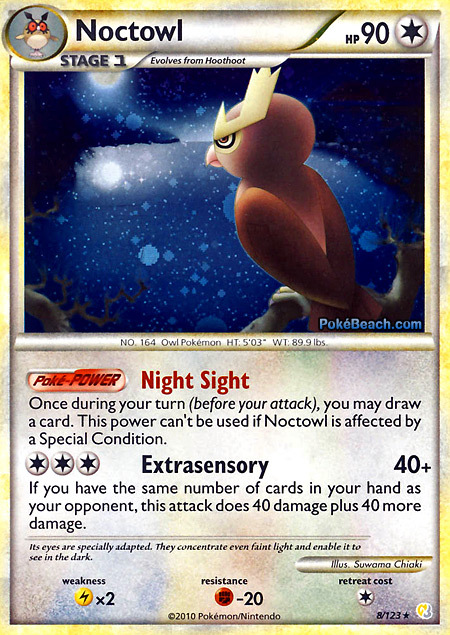 Sitting on a branch and gazing out over a lake at night really does give the impression that Noctowl is in deep thought about something none of us would be able to guess at and the holo version really does accentuate this card nicely. I’m going to give it a very nice 8/10. Theme design by Themesanyar. Powered by WordPress. Copyright © 2017 All Rights Reserved.